The Jezreel Expedition is using survey archaeology and advanced LiDAR mapping (LiDAR-generated model of site pictured) to better understand the occupational history of Tel Jezreel and its surroundings. Image courtesy Jezreel Expedition. While the excavation results were exciting, the directors of the current Jezreel Expedition, Norma Franklin and Jennie Ebeling, are using survey archaeology and advanced LiDAR mapping to learn even more about the Biblical city. Indeed, as the Jezreel Expedition has found, there is much more to Jezreel than just the fortified hilltop site. “Greater Jezreel” includes a nearby spring that was the lifeblood of the city, as well as a sloping agricultural terrace that extends north of the tell and overlooks the spring. What was the connection between the spring and terrace, on the one hand, and the Biblical fortress, on the other? To answer this question, the Jezreel Expedition recently scanned nearly 3 square miles of greater Jezreel with LiDAR mapping (Light Detection and Ranging) technology. LiDAR mapping produces high-resolution digital elevation data that, in turn, allows archaeologists to detect micro changes in topography and thereby discover natural and manmade features otherwise hidden by dense vegetation and undergrowth. 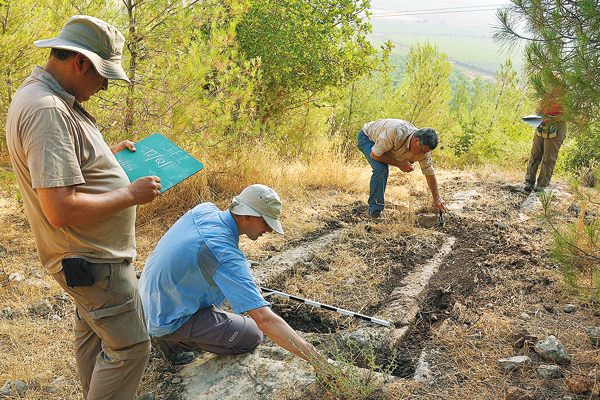 With new LiDAR mapping data in hand and armed with handheld GPS units, cameras and chalkboards, the keen-eyed student surveyors of the Jezreel Expedition then explored areas of greater Jezreel using pedestrian survey archaeology. They focused especially on the north-facing slope that runs down from the tell to the alluvial terrace and the area immediately overlooking the spring of Jezreel. In just a few weeks of survey archaeology, the Jezreel Expedition discovered 361 features, including 60 tombs, 57 agricultural installations, 21 ancient quarries, scores of walls and nearly 100 cisterns. Recording one of the 36 rock-cut trough tombs. Courtesy the Jezreel Expedition. The tombs discovered with survey archaeology will help the Jezreel Expedition understand the limits of the settlement in different periods, since burials were always located outside the settlement area. The agricultural installations ranged from small cup marks to large oil and wine presses, including one that may belong to the time of Naboth’s orchard, which King Ahab coveted and for which Jezebel had Naboth framed and executed (1 Kings 21). The expedition’s survey archaeology revealed Jezreel to be much larger than previously thought. Franklin and Ebeling, who will continue their work this summer, believe one intriguing area of further investigation will be the terrace, particularly the area overlooking the spring. LiDAR mapping revealed prominent building remains just below the surface that are not visible on the ground because of the area’s dense overgrowth. To learn more about the Jezreel Expedition and LiDAR mapping, read Norma Franklin and Jennie Ebeling, Archaeological Views, “Returning to Jezreel,” Biblical Archaeology Review, May/June 2013. *David Ussishkin, “Jezreel—Where Jezebel Was Thrown to the Dogs,” Biblical Archaeology Review, July/August 2010.